Over a hundred design professionals and associates of Calatrava gathered in lower Manhattan, on the tenth floor of Seven World Trade Center in a space overlooking his transit hub that is currently on site. The Chicago Athenaeum awarded the honor in conjunction with the European Centre for Architecture, Art, Design, and Urban Studies. Now in its sixth year, the European Prize for Architecture has previously been awarded to Bjarke Ingels of BIG and Italian designer Alessandro Mendini. Architect, artist, and engineer Santiago Calatrava was born on July 28, 1951, in Valencia, Spain. Calatrava attended primary and secondary school in Valencia. From the age of eight, he also attended the Arts and Crafts School, where he began his formal instruction in drawing and painting. When he was thirteen, his family took advantage of the recent opening of the borders and sent him to France as an exchange student. Upon completing high school in Valencia, he went to Paris with the intention of enrolling in the École des Beaux-Arts; but as he arrived in June 1968 during a period of student boycotts, he found his plan was unworkable. He returned to Valencia and enrolled in the Escuela Técnica Superior de Arquitectura, a relatively new institution, where he earned a degree in architecture and took a post-graduate course in urbanism. While at the school, he also undertook independent projects with a group of fellow students, bringing out two books on the vernacular architecture of Valencia and Ibiza. Attracted by the mathematical rigor of certain great works of historic architecture, and feeling that his training in Valencia had given him no clear direction, Calatrava decided to pursue post-graduate studies in civil engineering and enrolled in 1975 at the ETH (Federal Institute of Technology) in Zurich. He received his Ph.D. in 1981.Ph.D. thesis: Concerning the Foldability of Spaceframes. It was during this period that he met and married his wife, who was a law student in Zurich. After completing his studies, he took on small engineering commissions, such as designing the roof for a library or the balcony of a private residence. He also began to enter competitions, believing this to be the most likely way to secure commissions. His first winning competition proposal, in 1983, was for the design and construction of Stadelhofen Railway Station in Zurich, the city in which he established his first office. In 1984, Calatrava, designed and built the Bach de Roda Bridge in Barcelona. This was the beginning of the bridge projects that established his international reputation. Among the other notable bridges that followed were the Alamillo Bridge and Cartuja Viaduct, commissioned for the World’s Fair in Seville (1987-92); the Campo Volantin Footbridge in Bilbao (1990-97); and the Alameda Bridge and Metro Station in Valencia (1991-95). Calatrava established his firm’s second office, in Paris, in 1989, when he was working on the Lyon Airport Station (1989-94). He opened his third office, in Valencia, in 1991 to facilitate work on a competition, a very large cultural complex and urban intervention there, the City of Arts and Sciences, to which Calatrava buildings are still being added. Other large-scale public projects from the late 1980s and 1990s include the BCE Place Galleria in Toronto (1987-92), the Lyon-Saint Exupéry Airport Railway Station, Satolas, France (1989-94), and the Oriente railway station in Lisbon (1993-98, commissioned for Expo ’98). Exhibitions of Calatrava’s work were first mounted in 1985, with a showing of nine sculptures in an art gallery in Zurich. A new stage in recognition was marked by two solo exhibitions: a retrospective at the Royal Institute of British Architects, London, in 1992, and the exhibition Structure and Expression at The Museum of Modern Art, New York, in 1993. The latter exhibition included an installation in the museum’s Sculpture Garden of Shadow Machine, a large-scale sculpture with undulating concrete “fingers.” Santiago Calatrava: Artist, Architect, Engineer, an exhibition of architectural models, sculpture and drawings was presented at the Palazzo Strozzi in Florence, Italy (2000 – 2001). Similar exhibitions were mounted in 2001 in Dallas, Texas (to inaugurate the new Meadows Museum) and in Athens, at the National Gallery, Alexandro Soutzos Museum, and in 2003 at the Kunsthistorisches Museum in Vienna. In 2005 two solo exhibitions of his work as an artist were mounted in New York, one at the Metropolitan Museum of Art titled Santiago Calatrava: Sculpture into Architecture and the second at the Queen Sofia Spanish Institute, Clay and Paint: Ceramics and Watercolors by Santiago Calatrava. In 2006 the exhibition Obra Reciente y Proceso de Creación de Santiago Calatrava was shown in Oviedo, Spain, at the University. In 2007 Es Baluard Museo d’Art Modern i Contemporani de Palma in Majorca presented Santiago Calatrava: Escultures, Dbuixos i Ceràmiques and Santiago Calatrava: dalle forme all’architettura was exhibited at the Quirinale Palace in Rome. Projects completed since 2000 include Sondica Airport, Bilbao, Spain (2000); Pont de l’Europe, Orléans, France (2000); Bodegas Ysios winery in Laguardia, Spain (2001); Puente de la Mujer in Buenos Aires (2001); Calatrava’s first building in the United States-the expansion of the Milwaukee Art Museum, Milwaukee, Wisconsin (2001); James Joyce Bridge, Dublin, Ireland (2003); Auditorio de Tenerife, Santa Cruz, Canary Islands (2003); Three Bridges over the Hoofdvaart, Hoofdoorp, Holland (2004); Sundial Bridge, Redding, California, his first bridge in the United States (2004); Athens Olympic Sports Complex (2004); Zurich University Law Faculty (2004); and Turning Torso Tower, Malmö, Sweden (2005); Petah Tikah Bridge, Israel (2006); and the Palau de les Arts Reina Sofía (2006), the most recent major building in Valencia’s City of Arts and Sciences, Three Bridges in Reggio Emilia, Italy – part of a complex that will include a new high-speed railway station for the city (2007), Light Rail Way Bridge in Jerusalem, Israel (2008), Quarto Ponte sul Canal Grande, Venice, Italy (2008), and l´Assut de l´Or Bridge in Valencia, Spain (2008). Among the projects now nearing completion are the Palacio de Congresos, Oviedo, Spain; and the Samuel Beckett Bridge, Dublin, Ireland. 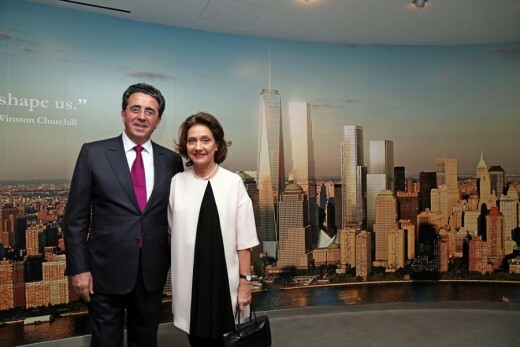 Calatrava opened an office in New York City in 2004 (having closed the Paris office in 2003) in order to be closer to a number of important recent commissions in the United States. These include the World Trade Center Transportation Hub in New York; three bridges over the Trinity River in Dallas, Texas; the first building for the University of South Florida Polytechnic’s new campus; and the Chicago Spire, a residential tower, which will be the tallest building in the Western Hemisphere when it is completed. Other projects in design and construction elsewhere in the world include Campus Buildings and Sports Center, Maastricht, The Netherlands; Agora, Valencia; The Peace Bridge, Calgary; and Città dello Sport, Rectorate and Campus Master Plan for Roma II University in Tor Vergata, Italy. Honors and awards given to Santiago Calatrava include the August Perret Prize from the Union Internationale d’Architectes (UIA) in 1987; the 1988 IABSE Prize from the International Association of Bridge and Structural Engineering; the Gold Medal of the Institute of Structural Engineers, London (1992); Creu de Saint Jordi from the Generalitat de Catalunlya, Barcelona, Spain (1994); Medalla de Oro al Mérito de las Bellas Artes from the Ministry of Culture in Granada, Spain (1996); Officier de l’Ordre des Arts et Lettres from the Republic of France (1998); Premio Príncipe de Asturias de las Artes in 1999; the 2000 Medalla de Oro of the Circulo de Bellas Artes, Valencia; the Sir Misha Black Medal, Royal College of Art, London (2002); the 2002 Leonardo da Vinci Medal from SEFI (Société pour la Formation des Ingénieurs); Grande Médaille d’Or from Académie d’Architecture, Paris; the Silver Beam Award from the Swedish Institute of Steel Construction (2003); the Golden Plate Award from the Academy of Achievement, Chicago, Illinois (2004); the 2004 Gold Medal from the Queen Sofia Spanish Institute, New York; Premio Nacional a las Artes y las Ciencias Aplicadas al Deporte 2004, from the Consejo Superior de Deportes of Spain; the 2005 AIA Gold Medal from the American Institute of Architects; the 2005 Eugene McDermott Award in the Arts from the Council for the Arts at M.I.T. ; Alta Distinción de la Generalitat Valenciana (2005); and both the 2005 Premio Nacional de Ingeniería Civil and 2005 Premio Nacional de Architectura from the Spanish Government. In 2008 he received the Gran Cruz de la Orden de Jaume I from the Generalitat Valenciana, Valencia. In 2009 he received the Golden Belgian Building Award in Brussels, Belgium. Many individual Calatrava projects have been honored by professional societies, publications and governmental entities. The Milwaukee Art Museum expansion was named “Best of 2001” by Time Magazine; “2002 Best Large Structure” by the Structural Engineers Association of Illinois; and “2004 Outstanding Structure” by the International Association for Bridge and Structural Engineering; and “2004 Outstanding Project Award” from the National Council of Structural Engineers Associations, Chicago, Illinois. Turning Torso Tower earned the “2003 Silver Beam Award” from the Swedish Institute of Steel Construction; the “2005 MIPIM Award” from the Marché International des Professionnel d’Immobilier; and the “fib 2006 Award for Outstanding Concrete Structures” from the International Federation for Structural Concrete. Liège Guillemins High Speed Railway Station was awarded the ESCN European Award for Excellence in Concrete in 2006, by the European Concrete Societies Network, and Calatrava projects have received a total of six ECCS European Steel Design Awards to date from the European Convention for Constructional Steel (for Kronprinzenbrücke, Berlin, in 1997; for Pont de l’Europe, Orléans, in 2001; for the Law Faculty Library, Zurich, in 2003; for both the Three Bridges over the Hoofdvaart in the Netherlands and the Olympic Stadium in Athens in 2005; and for the Three Bridges for Reggio Nell’Emilia in 2009. Santiago Calatrava was named a “Global Leader for Tomorrow” by the World Economic Forum in Davos, Switzerland (1993) and one of the “Time 100” most influential people by Time Magazine in 2005. He has received 16 honorary doctorates to date and is a Permanent Honorary Guest (Ständiger Ehrengast) of the University of Zurich.